It’s the year 2330. At the end of the twenty-second century, the human race has divided into two distinct groups—purebloods and the ‘modded’. Those who are unfortunate enough to be genetically modified are now nothing but servants for their pureblooded masters. Living in this time, you know your place, and you do not cross the line. So, when a violent death occurs in the Bronze District, Annalise is ordered to take this as her trial run at Divinity PD to prove that she can do the job as a member of the Human Possession Department. To defy her father’s wish to marry her off, and keep her Chief happy, she is determined to solve this murder by any means necessary—even if it means going to districts she has only read about in textbooks and fighting her forbidden feelings for her servant. 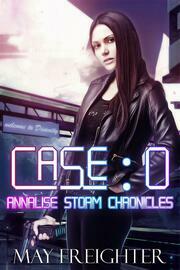 With internal battles, dirty politics, and sinister secrets, just how exactly will Annalise solve her Case: 0? And more importantly, will she live to see her next one?